Mtroniks VIPER Sport Tuned 20T Waterproof Brushed ESC Tamiya RC Car RC Buggy. There is no set-up button, you simply plug it in and go! It's as easy as that! 20 turn sport tuned motor limit. ABSOLUTE short circuit and motor overload protection. Waterproof 60A Brushed ESC Electronic Speed Controller Water-proof dust-proof BEC Output 6V/3A Switch Mode For 1/10 1:10 RC Car Features: Water-proof and dust-proof, suitable for all-weather condition. Small size with built-in capacitor module. Three running modes: Fwd/Br, Fwd/Rev/Br and Fwd/Rev, fits for various vehicles. Great current endurance capability. Great built-in BEC output capacity. Easy to set the ESC parameters with jumpers. Features: Water-proof and dust-proof, suitable for all-weather condition. Small size with built-in capacitor module. Three running modes: Fwd/Br, Fwd/Rev/Br and Fwd/Rev, fits for various vehicles. Great current endurance capability. Great built-in BEC output capacity. Easy to set the ESC parameters with jumpers. Multiple protections: Low voltage cut-off protection for battery / Over-heat protection / Throttle signal loss Protection. 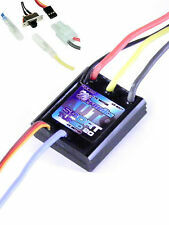 Mtroniks Sport Tuned 20 Plug and Play ESC. Ideal for most RC cars, trucks and buggys. There is no set button or difficult set up, you simply plug it in and go! It's as easy as that! 1 x Tamiya Male (Battery). 15Amp motor limit. ABSOLUTE short circuit and motor overload protection. 4 Layer super power circuit board. Legendary 100% waterproof designSpecification Wireless Madness was born out of love for RC Cars and RC Helicopters. Cont Current: 20A. BEC Mode: 5v/1A. Got an old brushed motor laying around and want to put it to good use?. FOR USE WITH BRUSHED MOTORS ONLY AND HAS NO REVERSE. Full Instruction Manual Included. WILL NOT WORK WITH BRUSHLESS MOTORS. / Peak Current: 60A /360A. Cars Applicable: 1/10: Touring Car, Buggy, Short Course Truck, Monster, Truggy, Rock Crawler and Tank. Resistance: Fwd 0.001Ω, Rev 0.002Ω. 540 or 550 Size Motor: ≥12T Or RPM<30000 @7.2V. / Peak Current: 60A /360A. This prodct is for: 1/10: Touring Car, Buggy, Short Course Truck, Monster, Truggy, Rock Crawler and Tank. Cars Applicable: 1/10: Touring Car, Buggy, Short Course Truck, Monster, Truggy, Rock Crawler and Tank. Using 2S (8.4V), without more than 540 motor. Do not dismiss your dream. -Connect to the power battery correctly, the red wires at both ends of this wiring boards are positive, black ones are negative. 1 Programming Card. Max reverse force: 25%,50%,75%,100%. Neutral range: 6%,9%,12%,work state. / Peak Current: 60A /360A. does not help anyone. We assure you that we will try our best to satiate your needs and resolve issues. Since all are busy, in place of ?. to redress your grievances. We generally solicit your whole hearted support in this endeavour. 30 A Brushless Boat ESC with 3A BEC. Constant Current: 30A. BEC: 5v / 2A. Acceleration: 6% / 9% / 12%. Running Mode: Forward with brake / Forward and reverse with brake / Forward and reverse. Reverse Force: 25% / 50% / 75% / 100%. 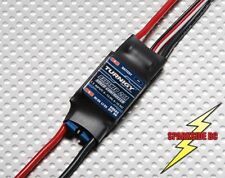 Hobbyking Smart Power 40A ESC with 4A BEC for use with Quad/Heli/Plane. Hobbyking have set the bench mark in quality, value and performance, so much so that this lightweight and highly versatile ESC can handle up to 6s and 20A burst current with complete peace of mind. Output current: Forward 320A. 1 320A Brushed ESC. Compatible with 6-12s NiMH/NiCd or 2-4s Lipo battery(7.2V-16V). Equipped with forward, reverse functions. Cooling fan: Yes. Heat sink: Yes. High-frequency drive system. 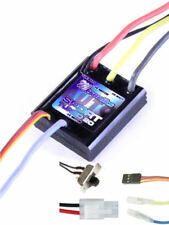 Mtroniks Viper Marine 15 HV 24V ESC. Designed for RC Model Boats running 12V-24V. 12 to 24V Operation. 1 x Tamiya Male (Battery). Forward and Reverse. However, this will only apply where the item has been subject to normal usage and has not suffered any form of misuse. Current: Forward 320A, Backward 160A, Brake 270A. With forward and backward functions for car and boat. Suitable for RC cars and boats. Item Type: RC Accessory. Connect to the power battery correctly, the red wires at both ends of this wiring boards are positive, black ones are negative. ESC for Tamiya RC Car Kits. Plug and Play - All correct connectors for Tamiya Cars with brushed motors. 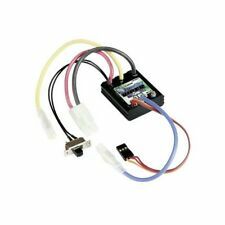 Tamiya Connector for 7.2v NIMH or NICD Battery. Tamiya Compatible. Forward and Reverse Motor Operation.